Adopted Statements in the Digital Age: Hearsay Responses to Social Media "Likes"
Social media users collectively register billions of "likes" each and every day to the endless flow of content posted on social networking websites. What an individual user actually intends by the quick click of the "like" button may vary widely. Perhaps she is conveying acknowledgement but not agreement. Maybe he is expressing support but not acceptance. Within the social media context, short-form clicks register the same response. Yet they may be intended to convey sorrow, joy, support, agreement, acknowledgement, humor, or a multitude of other emotions. What a user actually intends by social media "likes" depends entirely on the person and the post. In the evidentiary context of hearsay, however, the intent a user may be held to have manifested by "liking" online content has significant legal consequences. This Article addresses the nuanced question of applying social media "likes" to traditional rules governing the manifestation of adoptive statements in the hearsay context. It focuses on whether a "like" is a tacit adoption of the post itself or a far more casual and less concrete response that fails to manifest adoptive intent without more. Should a statement that would otherwise be excluded as the hearsay statement of a third party nonetheless be admitted as the statement of the individual who merely "liked" the comment? Does a single click manifest a belief in the truth of the online content? Or is a "like" merely an acknowledgement - the online equivalent of a shrug and nod - without more? How does a court discern this question when faced with the offer? This Article endeavors to answer these questions while offering courts and practitioners alike a functional analysis for determining whether social media "likes" may be deemed adoptive statements under traditional hearsay orthodoxy. 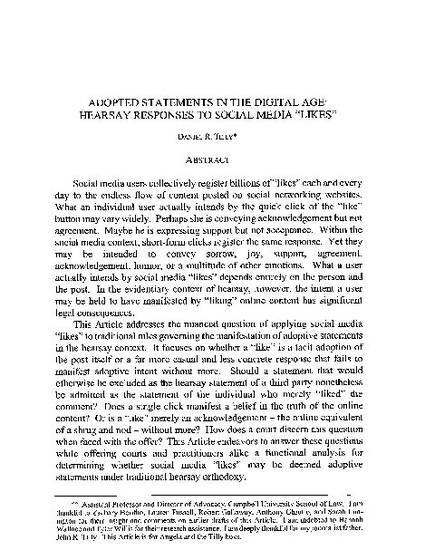 Daniel R. Tilly, Adopted Statements in the Digital Age: Hearsay Responses to Social Media "Likes", 93 N.D. L. Rev. 277 (2018).